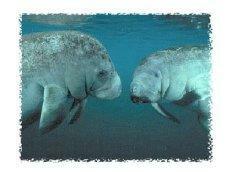 The West Indian Manatee is a large gray or brown aquatic mammal. Adults average about 10 feet long and weigh 1,000 pounds. They have no hindlimbs, and their forelimbs are modified as flippers. Manatee tails are flattened horizontally and rounded. Their body is covered with sparse hairs and their muzzles with stiff whiskers. Sexes are distinguished by the position of the genital openings and presence or absence of mammary glands. Manatees will consume any aquatic vegetation available to them and sometimes even shoreline vegetation. Although primarily herbivorous, they will occasionally feed on fish. Manatees may spend about 5 hours a day feeding, and may consume 4 to 9 percent of their body weight a day. During the winter months, the United States' manatee population confines itself to the coastal waters of the southern half of peninsular Florida and to springs and warm water outfalls as far north as southeast Georgia. Manatees also winter in the St. Johns River near Blue Spring State Park. During summer months, they may migrate as far north as coastal Virginia on the east coast and the Louisiana coast on the Gulf of Mexico. Manatee populations also exist outside the continental United States in coastal areas of the Caribbean and Central and South America. In Puerto Rico, manatees apparently occur around the southern and eastern end of the island and around nearby Vieques Island. Except for rare sightings, manatees seem to be absent from the Virgin Islands at present, but fossils have been found in middens on St. Croix. The population of manatees in Florida has been estimated to be at least 1,865 individuals. There are an estimated 60 to 100 manatees in Puerto Rico. In the last decade, yearly mortality in Florida has averaged nearly 150 animals a year, double that of the preceding decade. The average proportion of first-year calves in the population is 10 percent with a range of 5 to 15 percent. Manatees (family Trichechidae, genus Trichechus) are large, fully aquatic marine mammals sometimes known as sea cows. They contain three of the four living species in the order Sirenia, the other being the dugong, which is native to the Eastern Hemisphere. The clearest visible difference between manatees and dugongs is in the shape of the tail; a manatee tail is paddle-shaped, while a dugong tail is fluked, similar in shape to a that of a whale. Dugongs are most often seen alone or in pairs, usually a mother and her calf, but they have been sighted in large herds of several hundred. 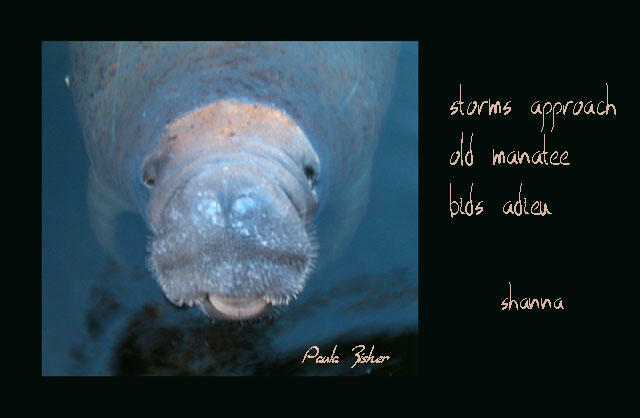 Dugongs have multiple mating partners, and may breed year-round. Their mating behavior involves groups of male dugongs splashing, tail-thrashing, and lunging as they compete for a single female. Although Dugongs breed year round, they show some seasonality, with mating and calving apparently peaking in spring and summer especially in the higher latitude limits of their range (Marsh 1999c).